There are 23 reviews of Escale à Portofino. This can almost fool you into thinking you're getting a chic, exotic-sounding Eau de Cologne, when in reality, you're getting a terrific, juicy citrus topnote, followed by a laundry musk so powerful Tide would run screaming. For those of us trying to avoid smelling like a dryer exhaust, beware. Escale à Portofino is an eau de Cologne variant with a lemony top note that’s natural enough not to smell like furniture polish. What follows is exactly the sort of citrus, herb, and jasmine accord one expects in an eau de Cologne formula, still pleasantly natural, but also well-balanced and sufficiently potent to carry a small distance without smelling loud or intrusive. On the other hand, I don’t smell anything that makes Escale à Portofino stand out among the many, many other well crafted eaux de Cologne on the market, so I’m not sure what justifies its limited-release status. Why hunt down Escale à Portofino when you can get an outstanding citrus scent from Guerlain, Acqua di Parma, Balmain, or Annick Goutal (to name just a few,) with much less effort? Citrus connoisseurs, Dior fans, eau de Cologne completists, or maybe just those with more sensitive noses than mine may find some attraction here that I’m missing, but pleasant as this fragrance is, I don’t get the point. Thumbs up (with hesitation) because it’s well done, not because I recommend acquiring it. Unisex but more to the side of feminine, this fragrance promises much and nearly delivers but suffers from lack of longevity. Starting with a light and airy neroli this turns rapidly into a soft almond base which unfortunately only stays around for an hour or so before vanishing. Very pleasant summer aroma but not worth purchase price in my opinion. Unisex refreshing and classy scent. Tends to be more feminine because it has a sweetness due to the almond (which i really enjoy). Lasting power and projection is average, and sillage is great. Definetely worth it! More lemon and petitgrain than orange and a final woody-milky and musky dry down with the almond's boozy-nutty undertone. Light and breezy with a cologny sparkling vibe and an old-school soul (because of the starring role played by a classy bergamot). The juice is essentially citric and energizing while the final almondy-woody muskiness holds on to be light and is just necessary to develop hints of smoothness. Its fresh and highly aromatic projection makes us guessing about something minty and spicy in the blend ( Blood-orange writes about juniper berries and caraway and i say that it's possible) cause i live that feeling. Pepper and mint? I guess. Effectively the juice teleports us back in Portofino or Capri, in the 60's, the years of italian Dolcevita full of good quality of life and huge projects for future. The juice is not fully complex or luxurious but is well crafted and joyful for a carefree hot mediterranean summer in the riviera. I am currently in mourning for Nina Ricci's Signoricci. I recently discovered (thanks to Basenotes !) that they've decided as of this year to stop producing this citrus legend. Having tried Escale à Portofino on two or three occasions in airports, I have to say that it comes pretty close to Signoricci. Delicious citrus notes, perfect for summer. 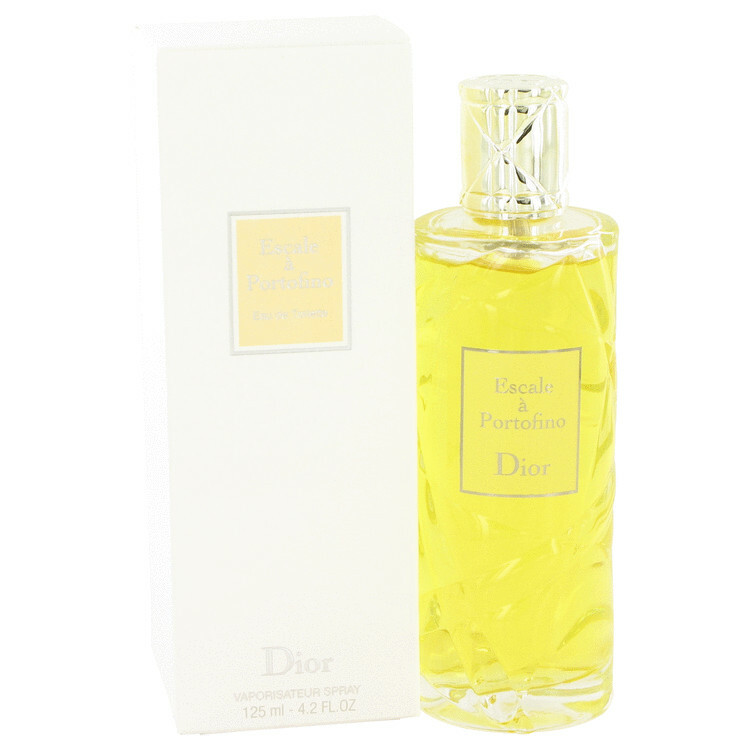 CHRISTIAN DIOR-ESCALE A PORTOFINO- EAU DE TOILETTE 4.2 OZ ...SPRAYED FEW TIMES!! CHRISTIAN DIOR-ESCALE A PORTOFINO - EAU DE TOILETTE 2.5 OZ ...NEW!!! There are no member images of Escale à Portofino yet. Why not be the first?